By the time I was a kid, most of the movie offerings from Disney were no longer animated features but had been replaced by live-action family films of various shapes and sizes. 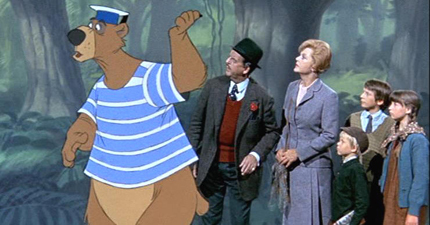 One I remember with fondness was Bedknobs and Broomsticks, released in 1971 but set in World War II England. Angela Lansbury plays Miss Eglantine Price, an unmarried woman living on the outskirts of the coastal village of Pepperinge Eye. Because of the bombings on London, war orphans have been sent out to various towns and villages to be cared for, and several arrive in Pepperinge Eye. Most are found good homes, but three siblings, Charlie, Carrie, and Paul, are put in the temporary custody of Miss Price until more suitable arrangements can be made. As it turns out, Miss Price is an apprentice witch who has nearly completed a correspondence course with Professor Emelius Browne of the College of Witchcraft and Wizardry. The children discover this after she receives her broom in the post and tries to learn to fly it after the children are in bed. Originally planning to run away, the enterprising youngsters decide to stick around and use their newfound knowledge as leverage to get some changes made in their living arrangements. Since Miss Price is not anxious for everyone to know she's trying to become a witch, she agrees to their deal. As a token of their understanding, she presents the youngest, Paul, with a shiny, brass bedknob which she enchants with a magic spell. After she learns that the final lesson for her correspondence course will not be coming because the College has been closed, Miss Price and the children decide to track down Professor Browne (David Tomlinson) in London by using the magical bedknob. By screwing the knob back onto the bedpost and using some magic words, the big, brass bed takes them through time and space and plops them down in the foggy streets of London, right next to Professor Browne. Despite the fact the Emelius Browne is little more than a would-be street magician, somehow the magic he's been teaching Eglantine seems to work and, for a number of reasons that seem perfectly plausible within the context of the film, the five of them set off on a journey to the island of Naboombu to secure a magical pendant, known as the 'Star of Astaroth.' Unfortunately, the pendant is in the possession of the king of said island, and he happens to be a lion. In fact, all of the inhabitants of Naboombu are animals, and the bed-traveling tourists show up in time to see a soccer game between the Dirty Yellows (a lion, a gorilla, a warthog, a rhinoceros, a hyena, and a crocodile) and the True Blues (an elephant, an ostrich, a hippopotamus, a cheetah, and a kangaroo). And somehow, Professor Browne gets roped into becoming the referee for the match. All of this is so they can learn the magic words necessary to create the magic spell of 'Substitutiary Locomotion,' which causes inanimate objects to come to life. But not to worry; Miss Price is a good witch (er, apprentice witch) and she's doing it to help the war effort (with some assistance from some suits of armor). Along the way, there's a lot of lovely musical numbers, and my favorite of the bunch is probably Portobello Road. The whole sequence at the island of Naboombu combines live actors with animated characters, some on land and some in the sea, where another favorite song is sung, Beautiful Briny Sea. The special effects throughout the movie hold up surprisingly well after four decades, in part because Disney was developing a new way of compositing images using the sodium screen vapor process, which was sort of the grandfather of today's green screen process. Bedknobs and Broomsticks was directed by Robert Stevenson, a veteran director of such Disney films as The Love Bug, The Absent-Minded Professor, The Shaggy D.A., and Old Yeller. He also has the distinction of being the only Disney director ever nominated for an Oscar when he got the nod for 1964's Mary Poppins. All in all, this is good, clean family fun. I recently watched it with my teenage son and my five-year-old nephews, and all of us enjoyed it immensely. Lots of funny moments, plenty of music and dancing, and enough real, human emotion to hold it together until you get to the requisite happily ever after. Bedknobs and Broomsticks certainly cast a spell on me as a kid, but the magic never wore off because it's just as enchanting now as it was then.